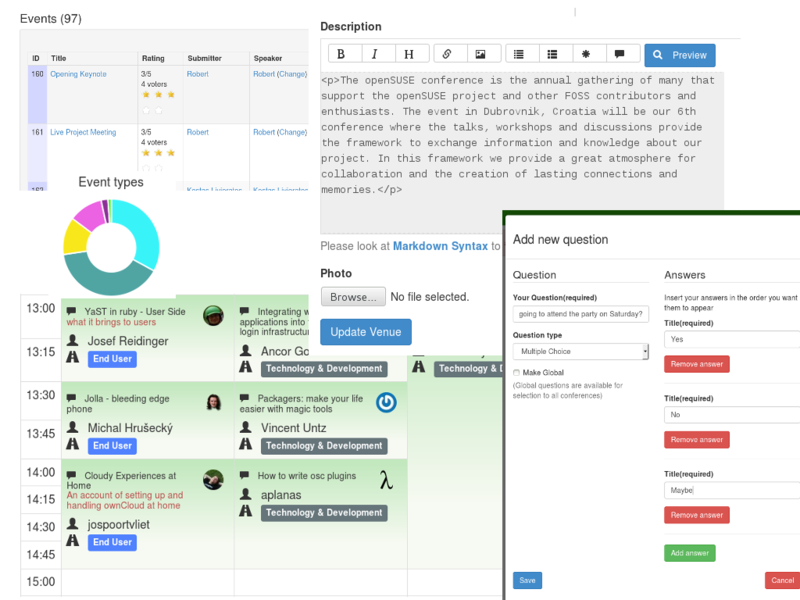 With OSEM it’s incredible easy to set up and manage all tasks to organize a successful open source conference. As conference organizer you can let people register for your event, run a call for papers and create an entertaining schedule out of users proposals. And as participant you have a central place to get all the info about the event. OSEM is used by openSUSE, owncloud and other Free and Open Source projects to run their events, it is written in Ruby on Rails, an open source web application framework. openSUSE has released OSEM as free software, under the MIT license. You can run, copy, distribute, study, change and improve it. The source code and the developers are on github. My GSoC project for OSEM is about implementing an organizer dashboard and it’s goal is to make it possible for conference organizers to get a glance at all relevant information about their conference. To simply make organizers aware about how their conference is doing. What to show on the dashboard? Program – Content I have accepted out of the submissions. As you can imagine, to present this information nicely we needed a chart library! So my first task was to evaluate various chart libraries and decide which would fit the best for our purpose. Finally we decided to use Chart.js because of it’s simplicity but also powerfulness. How many people are going to show up? The most important piece of information to show was the progress of the registrations over time. We decided that a week is enough granularity. To get this data I implemented a method in the conference model. We query the database for all registrations, group them by week and then count them. As you can see :week is a database column, this was nessecary to make this query database independent. We then go on to cumulate the registrations for each week, with padding on the left side (in case you haven’t registrations in the first weeks). That’s a nice dataset to show in a line graph! What are people submitting to my call for papers? For the call for paper submissions we not only wanted to show the progress but we wanted to show the progress of the different states (e.g. submitted, accepted, confirmed). As it turned out, this was not so easy as initially thought! The reason is that, as you can imagine, the event states change so that we can’t just do a simple database query at rendering time. Instead we have to take a snapshot each week of the event state distribution and save it to our database (like ‘historical data’). Luckily we use the papertrail gem to track the object changes. Therefore I was able to calculate the event state distribution of past conferences, too. :) To get the amount of proposals in a certain state I implemented the following method..
How is my program going to look? (or any other state) you will get the information just for this state. In the end, if you plug all of this together, we ended up with a nice dashboard for conference organizers. What’s left for the remaining GSoC time? Because of the new features that my GSoC colleagues and I implemented over the past weeks the admin interface has become very complex and confusing. As you can imagine, that’s very bad because an interface should be simple, easy and comprehensible. Otherwise the organizers won’t use our awesome new features. Reconsider and refactor the admin interface and menu will be my task for the remaining few weeks. Thank you for your work on this. It looks outstanding. I’m on the KDE Akademy Organizing Team, a GCoC mentor in previous programs, and one of the editors on the KDE news channel (dot.kde.org). I’d like to have a direct conversation with you about OSEM for an event in the U.S.
Would you please give me your email address where I can send you more information?